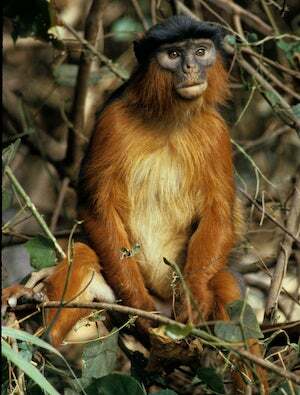 For years I spent my days, from before dawn until after dusk, following a troop of endangered red colobus monkeys around a small West African forest. For the most part the simian soap opera taking place above my head was based around everyday practical domestic themes like gorging; sleeping; snacking; resting; leaping; and forming and maintaining alliances. But, as with many soap operas, from time to time life here became totally unfocused and utterly confusing. The plots—and there were many—often drifted: sometimes boring, sometimes sitcom, sometimes rom-com, sometimes melodrama, sometimes kill-‘em-dead bloody action and sometimes high scary political drama. The characters, with enough variety to delight any casting director, ranged from gentle to not-so-nice, helpful to nasty, benevolent to downright wicked. With each passing day spent with these red- and black-haired, potbellied, thumbless, sometimes clumsy acrobats, it became more and more obvious to me that many things happening in this simian population were likely to have strong evolutionary continuity with what happens both with and to us humans. Their behaviors made it increasingly apparent that gaining a better understanding of them helps to understand ourselves. While they are obviously not us, they are far more like us than many people would like to admit. Or as Darwin pronounced almost 150 years ago, “The difference in mind between man and the higher animals, great as it is, certainly is one of degree and not of kind.” The similarities were disturbingly obvious when it came to the uses and abuses of leadership; the distribution of power and resources; the movement of individuals seeking safety, security, better resources and perhaps just adventure; and the interactions between different social troops. As time passed, evident parallels emerged between their social, psychological and especially political journeys through the canopy with the journeys we humans make on the ground. When a calm, confident, socially skilled, adaptable and benevolent, yet firm, leader with an amiable sidekick (or a cohesive hierarchy) ruled, internal disputes were easily and quickly settled, the troop sailed through short-lived, homegrown crises, peace was maintained and morale blossomed. A good leader was also able to mobilize collective action during territorial skirmishes, lead a troop into battle against external threats and come out victorious. While he (and yes, it was always a he) could not allow his troop to be totally and uncontrollably overrun by non-troop members, immigration was critical to maintain the overall welfare of the troop, both in the present and in the future. Immigration allowed for a constant gene flow, which kept the troop hale, hearty and healthy. It also created a cultural flow of innovative behaviors so that novel food sources and new travel routes introduced by immigrants enhanced nutritional and environmental opportunities. In order to make his troop attractive to immigrants, a successful leader needed to show that he, his troop and his territory were safe, accommodating and welcoming. A reliable troop leader needed to weigh costs against benefits, to communicate clearly, gather and cooperate with allies, maintain collective confidence, and see how all the parts of the social, political and physical environment related to the whole, always looking both inward and outward, upward and downward. At the same time, he had to avoid doing too much so that he didn’t risk exhaustion, or doing too little and losing sight of all the essential resources or allowing chaos to ensue. Too much or too little? Failure to him and his troop could come either way. In contrast, when a bully was in charge—particularly a bully with no accommodating wingman or cohesive hierarchy to give support—chaos could rule. Watching a bully take over and lead a troop was like watching a bloated, self-serving egotist create mayhem and confusion. With a leader that was often nasty, “off the rails,” full of malice and loaded with active schadenfreude, constantly indulging his dark side and unable or unwilling—I was never sure which—to curb those leanings, the troop appeared to run on fear, morale suffered, internal strife was an everyday occurrence, territorial disputes were lost, and necessary immigration slid downhill. Bullies used their massive egos to leap up the slippery dominance pole to gain power, status and recognition, threatening all and sundry along the way: juveniles, mothers with dependent young, older males and sexually receptive females. Quite simply, bullies lacked the simian equivalent of humanity and emotional intelligence, and their troops suffered. As I observed them over the years, it was easy to picture an astute troop leader as the colobus equivalent of a compassionate, successful president or prime minister, and a browbeating leader as the colobus equivalent of a selfish, only-in-it-for-himself, out-of-control bully. While colobus bullies push their troop mates around, human bully-boy leaders persecute or undermine journalists, judges, political opponents and even allies, violate the rights of minorities, shut the door to immigrants, put in place draconian and often poorly defined rules and regulations, bury factually based studies, stridently support fake information, whip up factionalism through the use of incendiary language and hate speeches, stamp on legislative and judicial bodies, remain unable or unwilling—I am never sure which—to accept personal responsibility whilst always placing the blame on someone/something else, and refuse to acknowledge the results of an election if they lose. In any society, be it simian or hominid, the bully appears to enjoy receiving false fawning from, and humiliating, his subordinates. He doesn’t care about serving the public good or working for the betterment of society. He only cares about himself. If an institution or an individual does not agree with him, it is to be disbanded or dismissed as a “witch hunt” against him. He exists in a world of me, me, me, I, I, I, not we or our or us. A troop, a political party or a country ruled by a bully is going to be governed badly and its non-compliant/non-ruling members will suffer. Fortunately for the colobus, a change in leadership, such as the ousting or death of a bully, can bring about fairly immediate reversals of fortune. Unfortunately for us, it doesn’t quite work that way. Human primate society takes a much longer time to recover from the havoc and toxic environment created by an incompetent, ruthless bully. If there is a simple message to be taken from the many decades and countless hours spent by thousands of researchers studying our fellow primates, perhaps it is this: While our species perceives the world through our own uniquely tuned assortment of senses with our own uniquely chartered evolutionary history in our own unique environment, our behavior is built on an evolutionary scaffold. A previous version of this article appeared in the Winter 2018 issue of New Humanist.